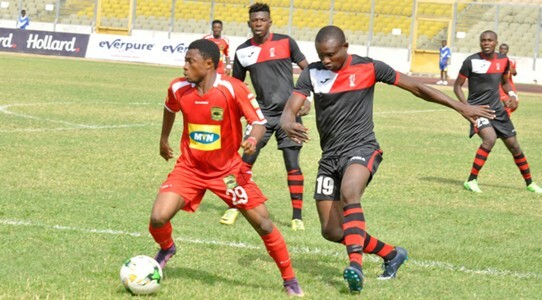 Ghanaian club Asante Kotoko earned a dramatic 1-0 win over Congolese CARA Brazzaville in the first leg of the CAF Confederation Cup preliminary round. In a strange occasion in football, referee Isasa Sy awarded five penalties in the game, four of which were to hosts Kotoko. The Ghanaian side, however, missed three penalty-kicks taken by different players and only managed to score the last one in the dying minutes of the match. Meanwhile, CARA missed their only penalty. Following early pressure from the Ghanaian side, they were awarded the first penalty after six minutes as a CARA defender handled the ball in the area. However, Kotoko missed a chance to take an early lead as Saddick Adams effort went off target. Both sides had a number of chances throughout the first half but they failed to send the ball into the back of the net as the first half ended goalless. The hosts had another chance to take the lead early in the second half after being awarded a second penalty for a foul inside the box, but Amos Frimpong penalty was easily collected by CARA keeper Chancel Massa. A third penalty-kick from Kumasi Giants’ Baba Mahama was also saved by the CARA keeper. In the 71st minute, CARA were awarded a penalty after a foul inside Kotoko box. CARA keeper Chancel, who had saved two penalties already, stepped up to take his side’s spot-kick, however, his effort was saved by Kotoko keeper Felix Annan. It wasn’t until the 93rd minute when substitute Yakubu Mohammed struck home the winning goal after scoring his team’s fourth penalty. Both teams are set to meet in the second leg of the preliminary round on 21 February at Stade Alphonse Massemba-Debat in Congo.